The region of the Causses and the Cévennes was awarded UNESCO world heritage status in 2011, thanks to the traditions of Mediterranean agro-pastoralism which have shaped the landscape over thousands of years. 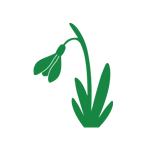 These traditions are very much alive today and continue to contribute to the extraordinary biodiversity of the area. Following ancient drovers’ paths, we will discover how closely the traditions of pastoralism are interwoven with the history of the landscape. 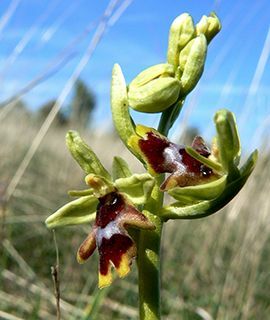 We will also make the most of the wealth of wild flowers, visiting certain sites known for their endemic or rare species such as Ophrys aymoninii, the Early Fly Orchid, and Cypripedium calceolus, the Lady’s Slipper. Walks will allow plenty of time to learn about the natural and human history of this varied and fascinating region. We stay for a week in a charming 4-star 12th century Chateau, with a pool, extensive grounds and a first-class restaurant serving classic French cuisine and wines. 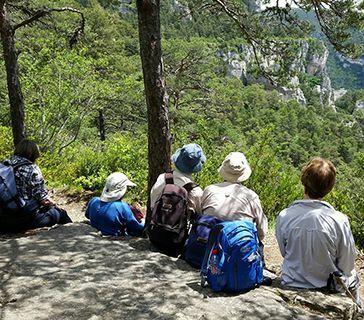 We explore the striking geology of the area, walking through natural rock formations above the gorges of the rivers Tarn and Jonte where all four European vulture species occur, descend the Tarn Gorge by boat, visit a stunning cave and medieval priory and discover a surprising variety of sheep’s cheeses during a cheese tasting. This was a really lovely trip; wonderful landscapes, flowers, vultures... Sarah and Katharine were a dream team and delighted in sharing their immense knowledge of and love for the area. They did everything to make it a wonderful week - they could not have been better. Felt like being on top of the world, fantastic scenery, flowers, food and wine. Good company and excellent leaders. One of the best of the many Kudu trips I've been on. After meeting at Montpellier airport in the late morning, we have a 2.5 hr private transfer by road up into the hills of the Cévennes National Park, pausing for lunch en route. Once settled into the comfortable rooms of our 4-star hotel, a glass of Muscat de Beaumes-de-Venise precedes a candle-lit dinner in the elegant dining room of this 12th century Chateau. 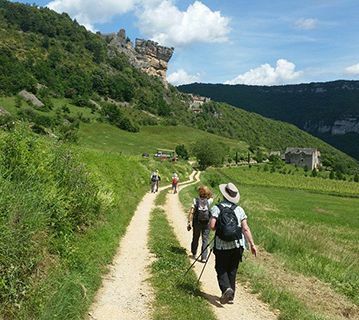 Easy paths lead us across the Causse Noir to the huge ‘chaos’ rock formations of Les Roquesaltes and the impressive Corniches du Rajol, with fine views over the Gorge of the Dourbie. In the far distance, we can see the world-famous bridge at Millau, designed by Norman Foster. 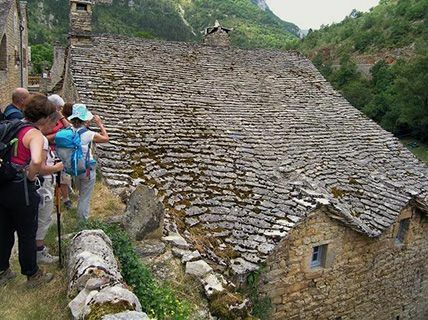 After picnicking amongst the rock formations, we visit the nearby 11th century Priory of Saint Jean de Balmes, the village of La Roujarie and a toit citerne, an ingenious construction to collect and stock rainwater in the arid environment of the causses. 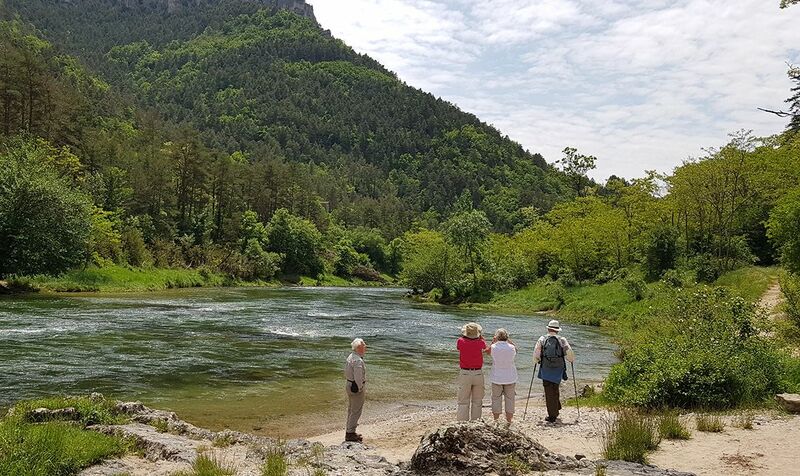 We set off for an easy day’s walking exploring the rock formations of Nîmes-le-Vieux, set in a particularly wild corner of the Causse Méjean. Our walk will lead us to the village of Le Veygalier, where we will have lunch in an excellent ferme auberge. 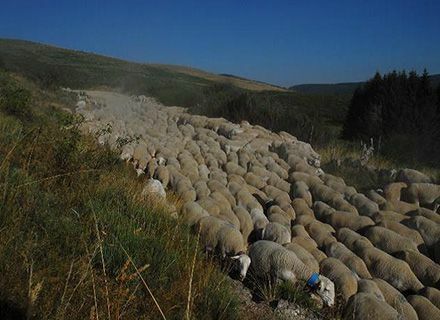 The owners of the auberge are also sheep farmers, from whom we learn about the long history of pastoralism on the causses, how this has shaped the landscape that we see today and how important traditional methods of agriculture are for biodiversity. Today’s walk offers a change of atmosphere. 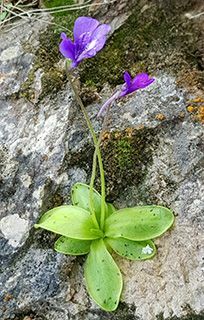 We leave the limestone of the Grands Causses to explore a wild landscape of granite and schist in the Southern Cévennes. We begin at 1200 m, following small paths through stunning beach woods interspersed with numerous mountain streams, waterfalls and breath-taking views. 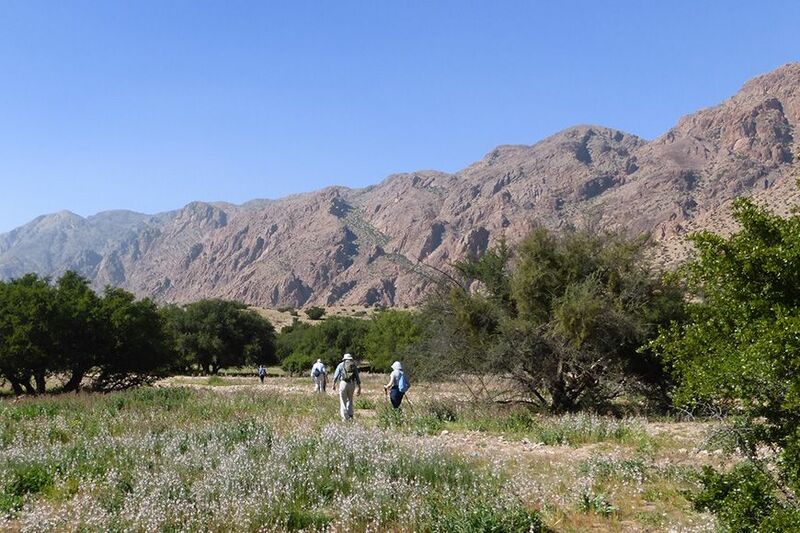 This rugged terrain is home to the mouflon, a primitive breed of wild sheep that thrives here. On the way back to our hotel, we will visit the summit of Mont Aiguoal. 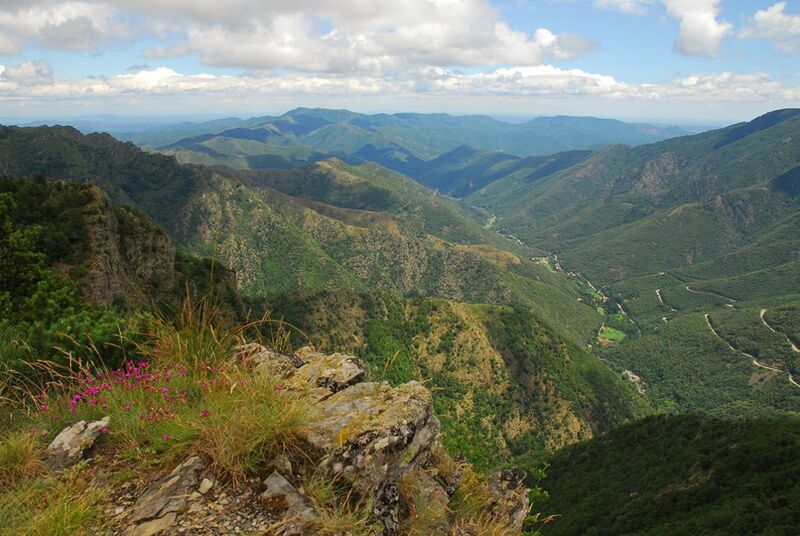 At 1567 m, this is the second highest point of the Cévennes with views that stretch (in fine weather!) from the Alps, to the Pyrenees and the Mediterranean Sea. A day off from walking today in order to experience two other aspects of the landscape. We begin with a visit to the stunning caves of ‘La Grotte Rose’ of Dargilan set on the cliffs of the Causse Noir. In the afternoon, we will gently descend the Tarn Gorge by boat. 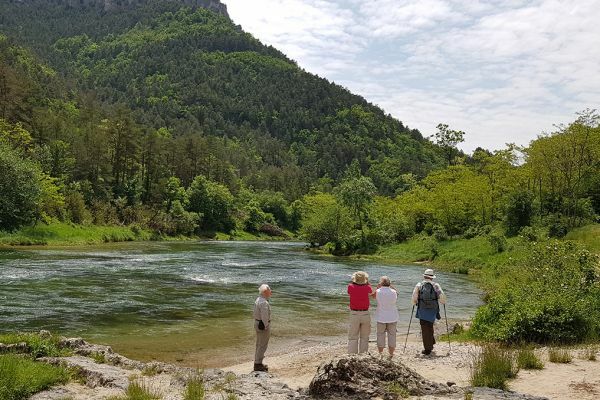 These two activities will give us a fascinating insight into the diversity of this limestone landscape, seeing the fabulous underground world beneath the plateau and exploring the gorges from the bottom as well as the top! An enchanting day that will allow us to rest our walking legs mid-week. In the evening, we go out for dinner in a renowned local restaurant. 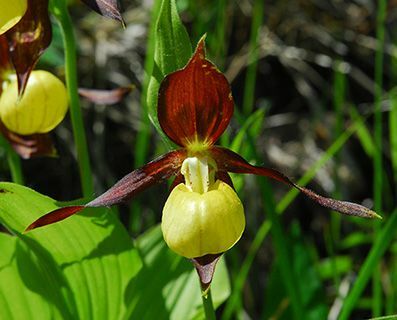 Our principal aim today is to discover an exceptional site for Lady’s Slipper Orchids, high on the cliffs of the Tarn Gorge. 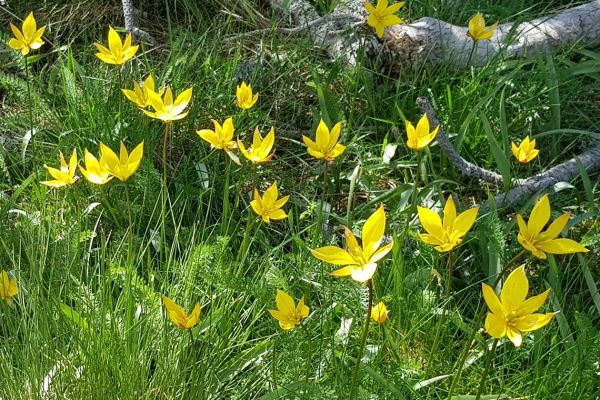 An easy walk of approximately 2 km will allow us to reach the site and on the way, we will make the most of the other flower and orchid species present. After the morning’s walk, we will drive for lunch and a degustation de fromage or cheese-tasting in the caussenard village of Hyelzas. In the afternoon, there is the option of returning to our hotel on foot or visiting the excellent rural museum in Hyelzas. In addition to seeing some of the most spectacular rock formations of the region, today’s walk offers excellent viewing opportunities for vultures. The gorges of the Tarn and Jonte are one of the rare sites in France to be inhabited by all four species of European vulture (Griffon, Black, Egyptian and the Bearded, or Lammergeier). Cliffside paths allow us to discover why this habitat is so ideal for these impressive birds. 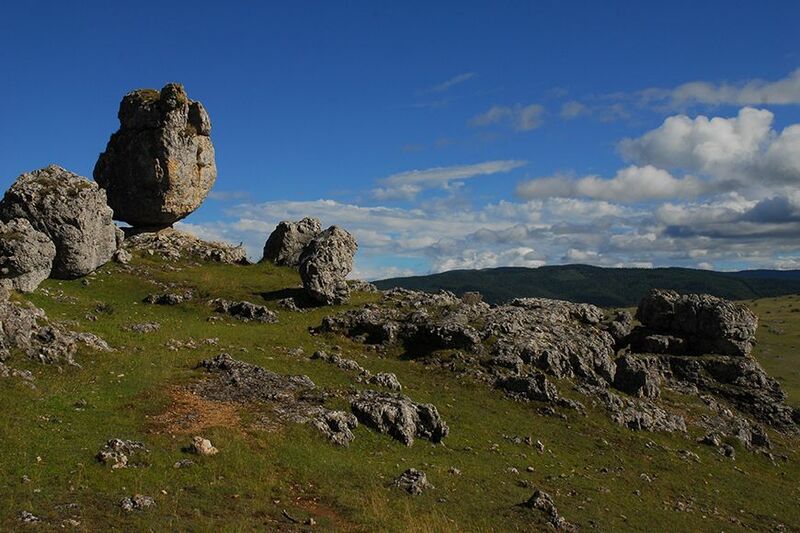 The day also provides an opportunity to learn a little of the geology that lies behind this extraordinary landscape. 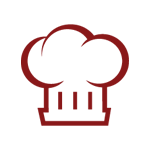 A memorable farewell dinner features classic dishes such as foie gras de canard, lamb roasted with local mushrooms and thyme and a walnut, almond and hazelnut tarte with chocolat glacé – complemented by fine French regional wines. Our visit to the Cévennes concludes with a private transfer to the airport for late morning flights home. 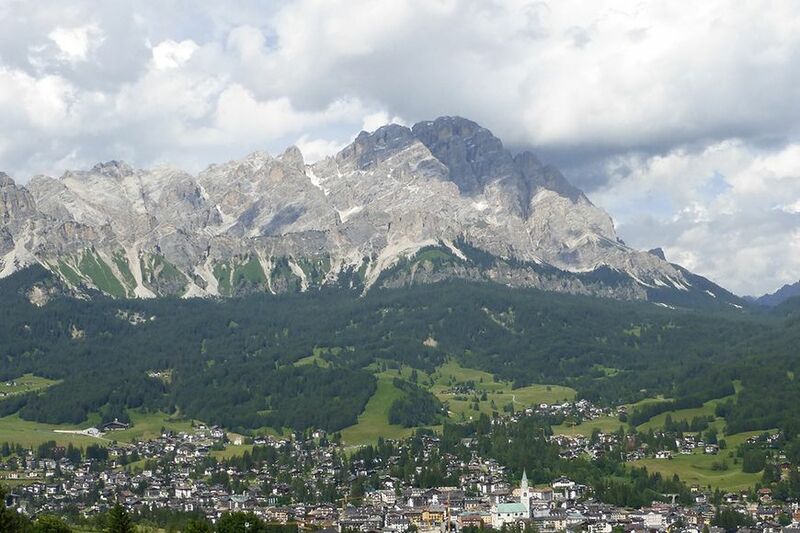 The above itinerary may be adapted according to group fitness and local weather conditions: the final choice of walks and activities, based on group security, rests with the tour leader. Please note that the double for single supplement is imposed by the hotel and not by Kudu Travel. If you are willing to share but no other suitable guest books on the trip, we regret that the supplement will be payable. Residents of countries in the EU can claim free (emergency) medical treatment in France by presenting their European Health Insurance Card (EHIC). At present there are no specific and compulsory health requirements for entry to France.You may also wish to check the advice given to travellers by the Department of Health and the FCO. 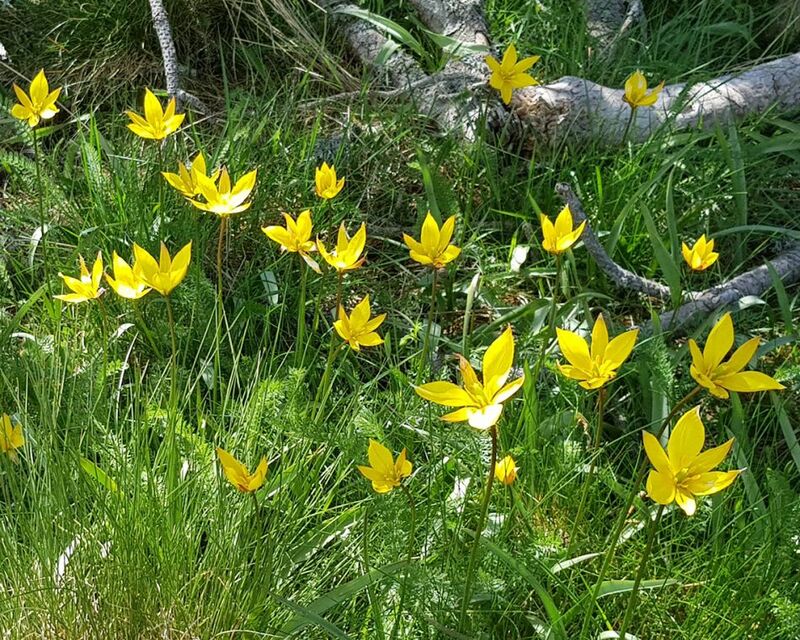 5 walking days, 2 – 4.5 hours at a suitably gentle pace. Paths can be rough and stony. We have minimised the ascents and descents but these may occasionally be steep for a short distance. Lightweight boots with good ankle support and robust vibram soles are essential. 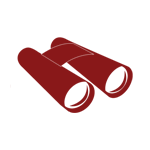 Walking poles/sticks of adjustable height are also highly recommended. Late May temperatures in the Cévennes range between 18°C and 24°C during the day (though the direct sun can feel warmer), with cooler evenings.